once installed on the company’s workstations, it provides industry leading proactive protection against viruses, spyware, rootkits, spam, phishing and other malware. 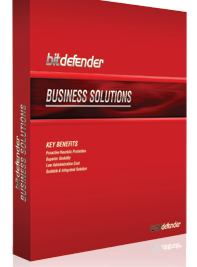 manages and controls Bitdefender Business Client and other Bitdefender server solutions. Bitdefender Security for File Servers is a business security solution especially dedicated to Windows-based servers. Easy to install, configure and manage, it effectively offers world-class protection from viruses, spyware and rootkits, while lowering the burden of administrating a server software solution. Bitdefender Security for Samba provides antivirus and antispyware protection for Samba network shares. By scanning all accessed files for known and unknown malware it keeps network users safe and it helps comply with data protection regulations. Highly flexible, the open source Bitdefender vfs module can be compiled against any Samba version, rendering it the ideal choice for your favorite Unix-based system. All Bitdefender solutions include B-HAVE, a patent pending technology which analyzes the behavior of potentially malicious codes inside a virtual computer, eliminating false positives and significantly increasing detection rates for new and unknown malware. To better deal with new spam, the Bitdefender Lab has created NeuNet, a powerful antispam filter. Inside the Antispam Lab, NeuNet is pre-trained on a series of spam messages sthat it learns trecognize new spam by perceiving its similarities with the messages it has already examined. Bitdefender’s award-winning scan engines featuring the B-HAVE technology have been recognized by leading certification bodies, including ICSA Labs, Virus Bulletin, West Coast Labs, for their unmatched proactive antimalware protection. The Bitdefender Corporate Security components receive the latest updates and patches based on three configurable technologies: on-demand, scheduled and automatic. Registered users benefit from free upgrades to any new version of the solution during the license period. Special pricing is always provided to our customers when they renew their license, making Bitdefender a long term cost effective solution. Certified representatives provide Bitdefender business customers with free permanent support online, by telephone or e-mail. This is supplemented by an online database with answers to Frequently Asked Questions and fixes for common issues. The enemy is changing... so should you. "The quantity of malware found is growing rapidly (graph has a logarithmic scale)." According to AV-Test's Andreas Marx "Since 2004, the level of growth has gone through the roof"